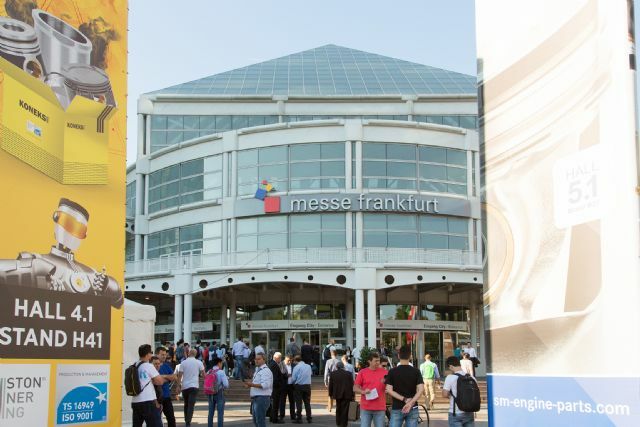 Automechanika Frankfurt 2016 was held September 13-17 in Germany as world’s most prominent automotive aftermarket exhibition (photo courtesy of Messe Frankfurt). 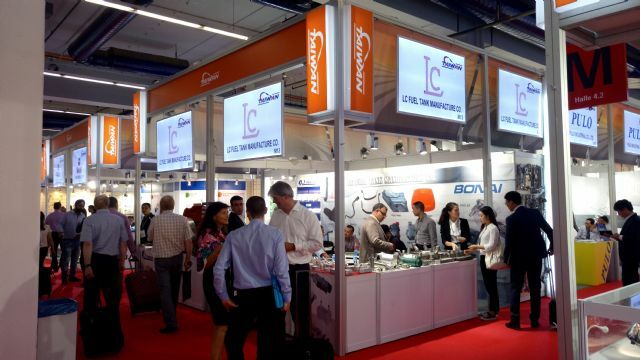 With the exhibitor number hitting a record high amid moderate global economic growth, Automechanika Frankfurt 2016, organized by Messe Frankfurt GmbH from September 13 through 17 in Germany, again lived up to its solid name as world's largest, most important trade fair for the global automotive aftermarket. To demanding buyers attending Automechanika Frankfurt, the chance of coming away empty-handed is slim, for the exhibition among others boasts the widest spectrum of exhibits for car servicing, including parts, car washing equipment, workshop and filling-station equipment, IT products and services, accessories and tuning products, by exhibitors from all over the world, to lead the way for the global automotive aftermarket and servicing industries. A total of 4,820 exhibitors at home and from abroad participated in the show, a record high in history (photo courtesy of Messe Frankfurt). 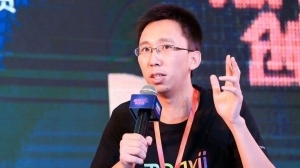 At a time when global enterprises in the face of moderate global economic prospects between 2015 and 2016 generally have hesitated to invest, the show still attracted over 130,000 visitors from 170 countries during its five-day run, which dived slightly from 137,982 ones in the 2014 edition. 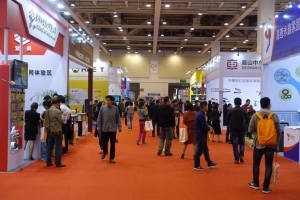 The mixed results of exhibitor and visitor participation indicate that most of global auto parts suppliers, especially those focusing on the aftermarket, preferred the trade fair to grow their businesses mainly due to the high quality of visitors, albeit grim outlooks of global economy. 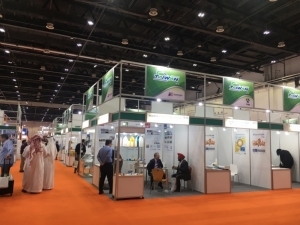 The organizer reported that while visitor satisfaction in the 2016 edition reached 95 percent, more than 80 percent of exhibitors were able to reach their visitor target groups and happy with their trade fair participation overall. From a macro point of view, continued advances of automotive technologies and growing popularities of new applications, such as connected cars, autonomous driving and advanced fleet management, were also among driving factors for the phenomenal exhibitor turnout seen in Automechanika Frankfurt 2016. 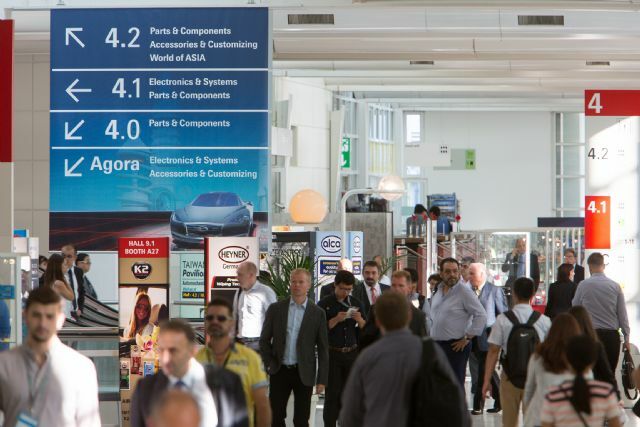 Actively spending on R&D to ride on the trend, ever more players in the automotive aftermarket and car servicing industries choose to debut their new technologies and products at the world's most influential trade fair to ensure a good start. Over 130,000 visitors from all over the world attended the trade fair (photo courtesy of Messe Frankfurt). One more reason that could explain the brisk participation of exhibitors in Automechanika Frankfurt 2016 is the persistently auspicious economic climate within the automotive sector. 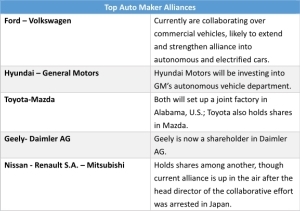 According to a report by IHS Automotive, a division of IHS Inc., U.S.-based market research firm, global car sales in 2015 grew by approximately 2.4 percent year on year to 88.6 million units, remaining on an uptrend for the sixth year in a row, and those in 2016 are estimated to have reached 89.8 million units. Hopefully, it forecasts, global sales will exceed 100 million units by 2018. Also confirming the sector's ongoing growth is Detlef Braun's report earlier, saying that overall revenue by local automotive and related sectors within the EU bloc totaled euro1.34 trillion in 2015, up 4.8 percent over 2014. Of the total, euro806.3 billion was generated by dealt cars, euro218.9 billion by OE and aftermarket auto parts and the remainder by car servicing. On another front, global sales of medium and heavy-duty trucks (also known as Class 4-7 and Class 8 trucks, respectively, in the U.S., which indicate models with gross vehicle weight rating ranging 6,351 kgs.-14,969 kgs. and greater than 14,969 kgs.) are projected by IHS Automotive to see a growth slowdown in 2016 after years of solid growth. However, the future for some players in the segment is likely to be more promising than the forecast suggests. Taking the U.S., world's second-largest truck market only next to China for now, as example, IHS Automotive reported that sales of Class 4-8 trucks nationwide reached 498,000 units, representing the second-sharpest year-on-year growth of 14 percent in the decade. Also notable is that the country's market demand and sales volume both kept expanding at double-digit growth rates in each of the past years since 2011. In 2016, U.S.'s overall truck sales are forecast to have seen a flat growth to only 502,000 units, mainly dampened by weak market demand for Class 8 models. Nevertheless, with an explosively growing number of trucks that were sold in the decade traveling on the road in the country, along with persistently weak oil prices, it is certain that market prospects in the coming few years for vehicle service providers and spare parts suppliers in the segment have been increasingly bright. 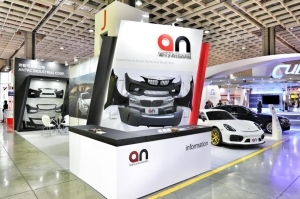 This has prompted the organizer of Automechanika Frankfurt to put heavier emphasis on promotion of such categories. 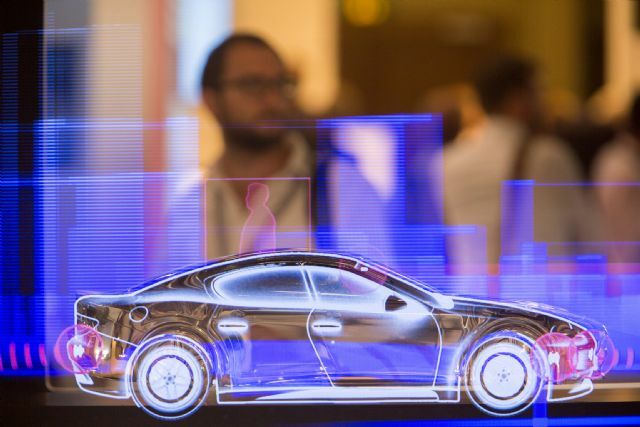 Technological advances for connected, drive-less vehicles are regarded as new growth engine for the global automotive and aftermarket industries in the years to come (photo courtesy of Messe Frankfurt). 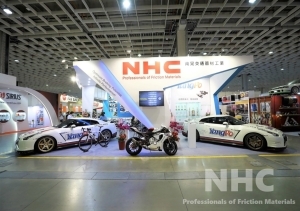 As a trend-setting automotive aftermarket exhibition, the show introduced several industry trends through special exhibition zones and themes set up by the organizer in the 2016 edition. One of the biggest hits with visitors on the showground was the exhibition zone “Tomorrow's Service & Mobility” in Hall 2, which not just outlines the future of the next-generation mobility, but helps people to envision the way workshops will work. 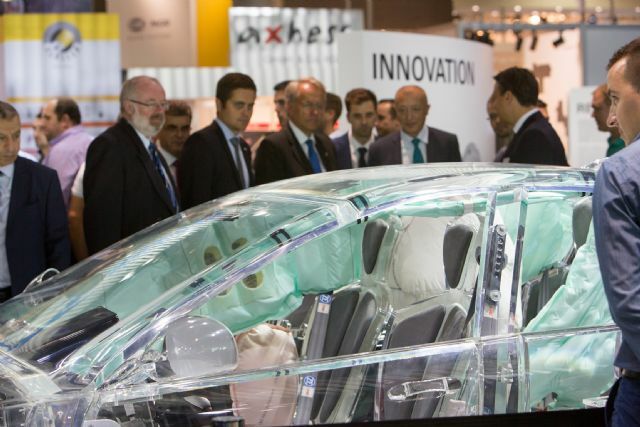 As various digital and electronic technologies have been widely applied in vehicles to achieve more comfortable, friendlier and safer driving and make vehicles “smarter” as a promising growth propeller for the global automotive and aftermarket industries, it was not surprising that such a special exhibition zone again pivoted intense attention from visitors at the show. “Tomorrow’s Service & Mobility” in Hall 2 attracted an influx of visitors interested in technologies and products of the future (photo courtesy of Messe Frankfurt). In addition to advanced technologies, including Internet of Vehicles, alternative power, autonomous driving and automotive communication systems, the exhibition zone featured new concepts and applications for car repairing and maintenance through wide-ranging products and services on display, to set the tone for Automechanika Frankfurt 2016. The organizer stressed that it provided visitors and industry insiders a look at prospective computer technologies, digital solutions and related devices to be applied in car servicing, which will combine to shape up the sector's value chain to include personnel training and incubation; engine, auto electronic and lightweight development; smart handheld device applications; financial consulting; battery and charging infrastructure; energy supplies; storage technologies; and repairing and related services. With technologies for drive-less cars fast advancing as hype in the global automotive industry, the same can be said of autonomous trucks, as the latest trends in the truck industry have been more pragmatic than ever before and driven not only by economic pressures but also by the desire for greater safety and improved environmental friendliness. 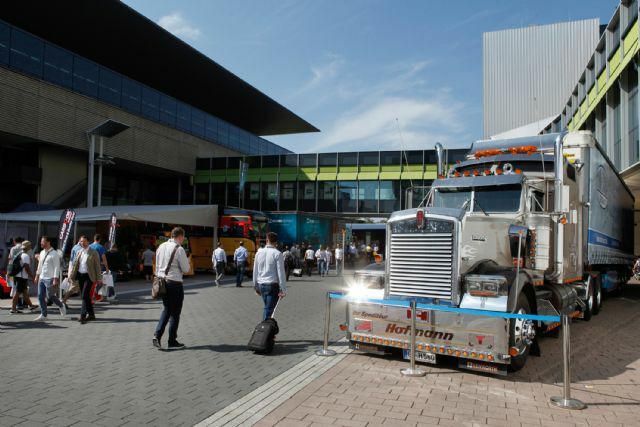 Amid the transition, the organizer of Automechanika Frankfurt 2016 again set out the “Truck Competency” program to help distinguish more than 1,000 exhibitors on the fairground, to impress visitors with innovative solutions revolving around such commercial vehicles, of which sales are regarded by economists and market researchers as a leading economic indicator. 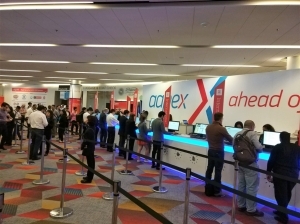 Through various pioneering projects, products and technologies brought by exhibitors to the venue, the ongoing trends on which the sector is riding could be summarized into four dimensions: higher payloads and lower fuel consumption, achieved by advanced engineering for more lightweight structure; alternative drive systems, developed to address growing concerns about sustainable energy usage and environmental protection; electronically controlled parts and components that operate solely on demand and only then consume power to attain better fuel efficiency; and networking, a concept from which drive-less trucks can be brought to reality to help transport companies better tackle fleet management and maximize profits. 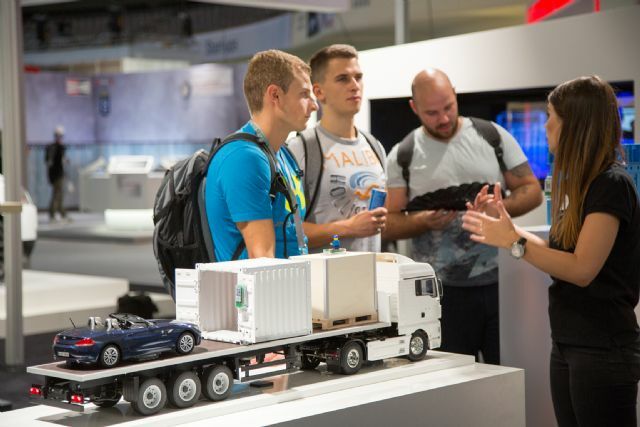 Automechanika Frankfurt 2016 continued setting out “Truck Competency” program (photo courtesy of Messe Frankfurt). Among technologies exhibited, an integrated autonomous driving (platooning) system developed jointly and already used by six European truck brands, namely DAF Trucks, Daimler Trucks, Iveco, MAN Trucks & Bus, Scania and Volvo Group, was perhaps the most astonishing. The manufacturers used trucks networked via WLAN, which continuously exchange data with each other and, therefore, can be electronically coupled within only a small gap of about 15 meters between each of them. With only the first vehicle in the electronically linked chain, or called the platoon, controlled by a driver, the other trucks follow automatically thanks to the networking, and the resulting synchronization of the assistance systems ensures the highest degree of safety. Plus, the platooning brings another striking benefit: greater economy and environmental friendliness. According to the exhibitors, when running in a platoon, the trucks can achieve fuel savings of between two and eleven percent, depending on their position in the column. 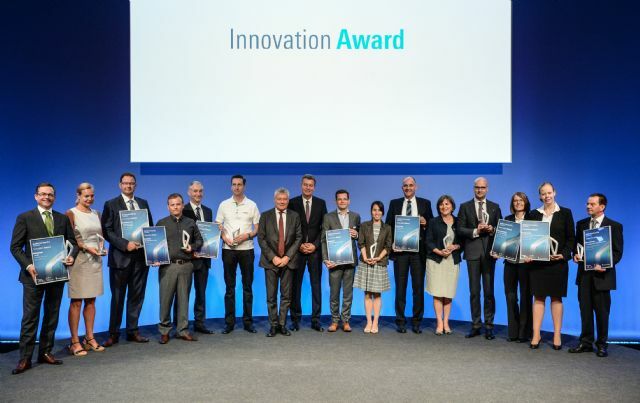 Eight winners of Automechanika Innovation Awards were revealed and honored during the show (photo courtesy of Messe Frankfurt). For industry insiders and global buyers seeking new growth engines for their businesses, Automechanika Frankfurt which holds Automechanika Innovation Awards in every edition to underline new ideas and innovative products by exhibitors is absolutely the best destination. 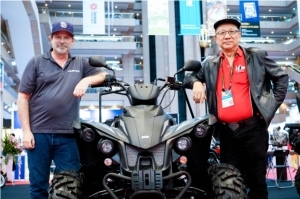 In the 2016 edition, from a total of 130 entries, including 72 ones from outside Germany, in the contest, eight winners in respective categories—Parts & Components, Electronics & Systems, Accessories & Customizing, Repair & Diagnostics, Repair & Maintenance, Management & Digital Solutions, Car Wash, Care & Reconditioning, and OE Products & Services—were selected. Among the winners, Robert Bosch GmbH was honored for its M Li-ion Motorcycle Battery (12V starter battery, LTX12-BS) in the “Parts & Components” category, an extremely lightweight lithium-ion battery featuring four times the service life of conventional lead-acid models and stable operation under high temperature; and On Board Defence impressed the judge in “Electronics & Systems” with its Protector, an advanced anti-theft device that can stop unauthorized communication with vehicle systems on the OBD (on-board diagnostic) port. Meanwhile, the winner in the “Accessories & Customizing” category was Continental Reifen Deutschland GmbH with its WinterContact TS850 P with TaraxaumTM Dandelion Rubber, a tire for mid-sized and luxury vehicles and SUVs and noted for its enhanced snow traction given by 5-grip thread patter completely made of dandelion rubber. 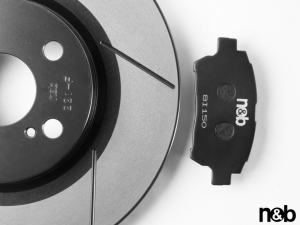 NGK Spark Plug Europe GmbH defeated competitors in “Repair & Diagnostics” with NCEM® (NTK Compact Emission Meter), allegedly world's lightest, most compact multi-gas emission meter that supports engine and vehicle test facilities as well as real driving emission tests. Continental Reifen Deutschland’s WinterContact TS850 P with TaraxaumTM Dandelion Rubber (photo courtesy of Messe Frankfurt). CORGHI S.p.A. was chosen as winner in the Repair & Maintenance category with its UNIFORMITY, world's first diagnostic tire changer highlighted with its instruction systematically given to technicians, which is generated from automatic measurement of rims and tire defects using a presser roller and laser sensors; and AVL DiTEST GmbH won the award in “Management & Digital Solutions” with its AVL DiTEST Smart Service 4.0, an analysis software that guarantees products to be aligned optimally to customer requirements. WashTec Cleaning Technology GmbH received the laurel in “Car Wash, Care & Reconditioning) for its MultiFlex Side Washing System, a side brush that pivots backwards long the lengthways axis when washing the rear of the vehicle and presses itself flexibly onto the slanting side for maximum vehicle contact. Beating the competition in “OE Products & Services” was VALEO, who brought its Valeo SCALATM Laser scanner, world's first laser scanner specifically for the automotive mass production. At Automechanika Frankfurt 2016, a total of 452 exhibitors from Taiwan, mostly in Hall 4.1 and Hall 10.1, impressed visitors with their manufacturing and R&D prowess through various innovative, high-quality and marketable products and services displayed. It is not overstated that Taiwan plays a pivotal role in the global auto-parts supply chain, with exports having remained on an upward trajectory over the years. Presently, the industry is composed of about 2,800 makers on the island, including about 300 original equipment (OE) suppliers, many of whom also produce AM products. EDN and CENS headed the largest exhibitor group from Taiwan to Automechanika Frankfurt 2016. 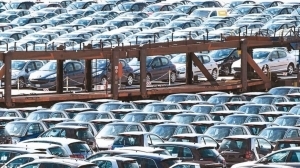 According to the latest statistics compiled by Taiwan Transportation Vehicle Manufacturers' Association (TTVMA), Taiwan's exported auto parts amounted to about US$6.6 billion in 2015, up 3.26 percent from US$6.39 billion in 2014 and representing a continued growth for the sixth year since 2009. 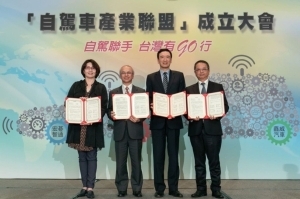 Approximately 80 percent of Taiwanese suppliers' exports channel to the global aftermarket (AM), making the island's one of the world's most important supply bases for AM replacement auto parts. 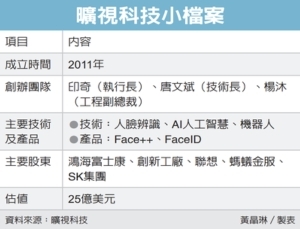 To enable interested buyers to experience in benefits generated from the distinctive competencies mentioned above, EDN (Economic Daily News), Taiwan's biggest business-focused newspaper and exhibition service provider, and CENS headed a group of 217 Taiwanese exhibitors to Aumechanika Frankfurt 2016, together with the Taiwan External Trade Development Council and the Taiwan branch of Messe Frankfurt (HK) Ltd., which lead an exhibitor delegation of 67 and 155 companies, respectively. The Taiwanese exhibitors include Nan Hoang Traffic Instrument, a friction-material product maker at booth K50 in Hall 4.2; Mycarr Lighting Technology, a manufacturer of LED lamps and bulbs for cars and motorcycles and manning the booth N16 in Hall 4.2; Tong Yang Industry, a globally known supplier of body parts and hosting booth K03 in Hall 4.2; Hwang Yu Automobile Parts, a specialized producer of chassis and brake components with booth P34 in Hall 4.2; Miin Luen Manufacture, a tensioner and timing belt supplier and holding booth L61 in Hall 4.2; A-Kraft Tools, a top-end hand tool OEM at booth G92 in Hall 10.1; William Tools, a world-caliber ODM of ratchet torque wrenches at booth B73 in Hall 10.1, and many others. The next Automechanika Frankfurt will take place September 11-15, 2018 in the same venue. 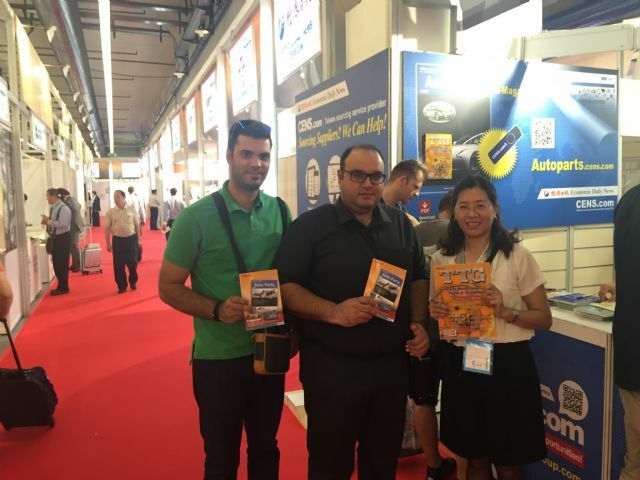 EDN and CENS held booths at the exhibition to circulate professional buyer guides and promote Taiwanese auto-parts suppliers.